I was honored to make the top 11 (not the top 10) in the Top HR Digital Influencers 2009 list. The list of bloggers here is really fantastic, and it’s flattering to be on here. This list is based on certain levels of traffic and links and stuff like that (quantifiable stuff), not necessarily quality of content or even whether they are active bloggers anymore (Joel Cheesman is ranked at #3 but discontinued his usually-number-one blog back in September). It’s really cool to see relatively-newcomer Mark Stelzner on this list, and it’s even more cool to see he’s at #1. Mark has done a fantastic job as the founder (cofounder?) of Job Angels. Launce Haun has always been awesome and well-respected, as have Jessica Lee (met her in person!) and Kris Dunn. I’m surprised to have gotten a better ranking than Laurie Ruettimann (what a punk she is!) and Jason Davis, as both of them have been a big part of RecruitingBlogs.com, which is one of the best-run Ning sites I’ve ever seen. It’s an honor to rank higher than Bill Vick, recruiting genius, and Peter Clayton, the mastermind behind Total Picture Radio, even though I think they are way better than I am. There are a few names I don’t recognize, but I’ll get familiar with them in a bit. If you are interested in jobs, job creation, employment, recruiting, the job search and hiring issues, there’s a great list of blogs to follow. I do wonder (so does Laurie R.) why some other terrific advisors are not on this list – I mentioned the writers at Career Hub recently, and I never see Nick Crocodilos (brilliant information) on any of these lists, although he should be. And it will be interesting to see my competition and other job seeker software vendors get on these lists next year (hopefully), as many of the resume writers and career coaches who have started blogging in the last year or two. Oi vey, where are the outplacement firm blogs? 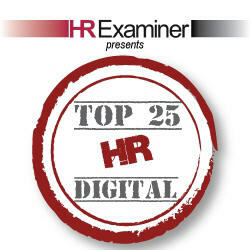 Thanks HR Examiner, for the recognition and work! This is wonderful news, Jason! Well deserved and truly earned. Glad to see “oy vey” in your post, even if you spelled it wrong. There are a few people like Frank Roche (http://knowHR.com) and Steve Boese’s technology blog (http://steveboese.squarespace.com/) that didn’t make it on there. I think those guys are influencing — digitally — in important ways. I always read their stuff.